I’ve decided to hire myself out to the state of Nevada for weather control. I will agree to host a yard sale one weekend a month. It is guaranteed to rain, sleet or snow. This weekend it did all three. I know it is April and spring and blah, blah, blah, but seriously. It rained off and on for two days. We needed it, so I just shuffled my stuff to my lovely big back porch and arranged everything in the garage. A lot of brave souls came out and picked through my junk. I made hot coffee and met some neighbors which was deeply cool. Sunday dawned clear and cool and warmed up to what I’ve come to expect from Nevada weather. By afternoon I was even a little sunburned. My son and I painted a huge sign to put up and my engineer husband built a stand for it. We hauled it down to the main road and put it up and the people, they began to come. It was a steady stream all day until dark. I would say I sold about half of what I had out – mostly the big stuff which is nice. I think I’ll run it once more this weekend and arrange for the charity truck to come on Sunday afternoon if possible. Then they can take it all away. Far, far away. I was surprised at how few pangs I felt about selling things. It was fun telling people that I bought that in Africa or India or Dubai or Singapore. They loved getting things for so cheap since I was focused on getting rid of things, not making a fortune. And I loved talking to everyone. Met a ton of neighbors. People I’ve lived close to for almost three years and never met. Shame on me. Happily I met my goal and made enough to buy a puppy on Craigslist and pay for the vet to check her out and get all her shots. Her name is Bryn and she’s just amazing. 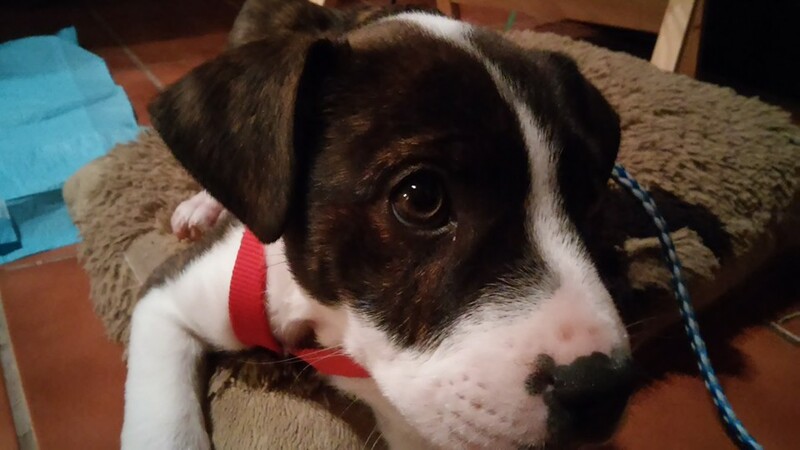 A little brindle pit bull mix (we think) that is 10 weeks old. She’s already stolen our hearts so I hope she’s healthy. That’s the danger of buying a puppy on Craigslist. You have NO idea what has gone on in that baby’s life. She seemed awfully hungry the first day, gulping down her food and water. That’s slowed down as I think she’s figured out she’ll get fed three times a day, as well as treats for training. She’s a little love. Right now she’s sitting on my foot, sleeping after a meal, a walk and a crazy hour of puppy play. She’s very cuddly and we’re working on the mouthing/teething. Natural for a puppy – usually they learn not to do it from other dogs but apparently she was taken from her mother at 6 weeks. Too early for some of that natural socialization, so we’ll have to be her pack and teach her. I think it is natural that there is some sadness mixed in with the fun. Just after dinner last night my son broke down. We’d been expecting it, but it was still painful. I think he was feeling guilty about being so happy with the puppy, that somehow it was disloyal to Sophie. Not a chance. Sophie loved that boy with all her heart. She loved all of us and we loved her. We miss her, we probably always will. There will always be that tug of guilt that we didn’t do more to keep her safe. But we’ll channel that into Bryn and keep her safe and love her forever. She’s part of the family now.